A polymer of glucose that can form a double helix and functions primarily as energy storage in plants. Filamentous actin forms a helical structure with two strands of polymerized g-actin. This is a structural component of the cytoskeleton. 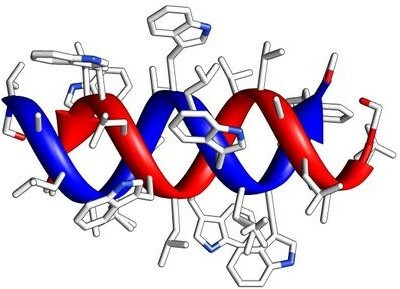 Protein motif with a helical structure formed by two (or more) α-helices. Coiled coils are found in a diverse range of proteins from structural proteins like keratin to transcription factors like c-Fos. A peptide-based antibiotic that has been shown to form membrane spanning double helices. Yes, double-stranded RNA as found in some viruses. The structural protein collagen consists of a triple helix of polypeptides. Whether this answers the question is arguable—you could say that the triple helix contains double helices. In any case, depending on what prompted your question, I thought it might be an interesting structure to consider. Not the answer you're looking for? Browse other questions tagged biochemistry molecular-biology structural-biology 3d-structure dna-helix or ask your own question. Dyes to bind to double stranded DNA? Do we consume dna, proteins of other organisms? Are microtubules in centrioles helical, like they are when in isolation?